Very true and very sad Morkel. Man is killing this world that so many people take for granted. 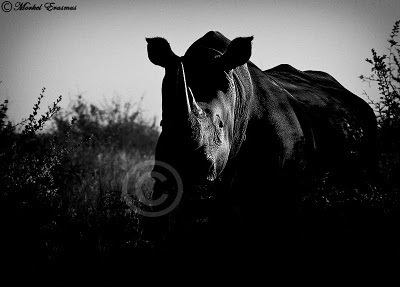 The image you have captured certainly conveys the dire straits the Rhino specie is in, and they are in desperate need of our help. Too True. And it won't end real soon. There is no balance between the commercial use of land and protected areas - greed, and demands for food from the 6 billion people on this planet take it's toll. If you read this link to a news story you will find another shocking revelation - that South African politicians have sold one of our World Heritage sites for the proverbial Lentil Soup. The Australian company has already started strip-mining the area in preparation for the open-cast mine that they have been granted "unconditional" license for.